Zach Matley and AtariAge have chosen the 28 playfields that will be included in the Combat Redux binary and the cartridge to be released at PhillyClassic 5. The three random recipients of a Combat Redux cartridge are Al Kuester, DDCecil, and Walter Lauer. Pictured to the right is the label created for the Combat Redux cartridge by Dave Exton. Every individual who had a playfield chosen will receive a $5 gift certificate in the AtariAge Store. Congratulations to all the winners, and thanks to everyone who made this a hugely successful contest! If you enjoyed making playfields for Combat Redux, you'll want to go take a look at the Indy 500 XE Track Design Contest we're presently hosting! Ask anyone what games they played on their Atari 2600 when they were younger, and invariably Combat will be included among the titles listed. For many years, Combat was the pack-in game that came with every Atari 2600 sold, and even today it's tough to avoid stumbling among Combat cartridges when you're looking for 2600 games. The premise in Combat is fairly simple. You and a friend battle one another in tanks, bi-planes and jet-fighters to see who can score the most points in a fixed amount of time. The original version of Combat supports many game variations, but few unique playfields. Zach Matley has created a new version of Combat, dubbed Combat Redux, that allows for 28 unique playfields. This new version of Combat supports seven groups of four playfields each: seven open mazes, seven easy mazes, seven complex mazes, and seven cloud designs. The first three groups are for tank games, and the last group is for jet-fighter and bi-plane games. To help create new playfields for Combat Redux, AtariAge and Zach Matley have teamed up to sponsor a Combat Redux Design Contest. To that end, Zach has created a Windows-based editor that allows you to design playfields and immediately test them in your favorite Atari 2600 emulator. Those who don't use Windows can still submit entries by sending us a text file that we will then convert into a binary (more information here). Some sample playfields created with the editor can be viewed here. We will choose 28 different playfields from all the entries received, and then include all of them in Combat Redux. Each person with one or more more entries selected will receive a $5 gift certificate in the AtariAge Store as well as credit in the Combat Redux manual. Additionally, three winners will be selected randomly to receive a free Combat Redux cartridge. To enter, you'll first need to download the Combat Playfield Editor that Zach Matley has written for Windows. If you don't have Windows, you can still submit entries by creating a text file in a specific format. More information about creating mazes in this fashion can be found here. After downloading the editor, unzip it and run editor.exe. 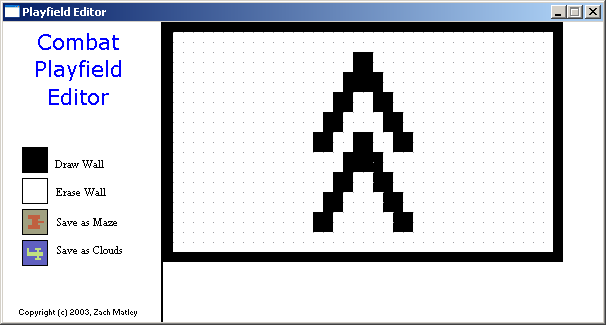 The editor will start and you can begin drawing in the area occupying most of the screen on the right. Keep in mind that Atari 2600 playfields are symmetrical, so what you are drawing is an image that is mirrored on both the left and right halves of the screen. Once you start drawing with the editor you'll quickly realize what this means. To draw walls, click on the Draw Wall icon on the left. To erase blocks, click on the Erase Wall icon. When your design is complete, click on the Save as Maze icon to create a Combat binary that will allow you to play your design using tanks where the walls are solid objects. To test your design with planes where the planes pass through the clouds, click on Save as Clouds. The editor will create the binaries in the same directory the editor is located in. You can use an emulator such as z26 to run the binaries generated by the editor. Open Maze This is a Tank game, with a relatively simple maze that is punctuated by few obstacles. Easy Maze A Tank game with more obstacles than in an Open Maze game, but the maze should be fairly easy to navigate and allow for some long shots. Complex Maze A more devious Tank maze with more walls that will require you to hunt down your opponent before you can get in a clear shot. Clouds A game for Planes where the obstacles do not interfere with the planes, but instead hide them as the planes pass underneath. We are looking for designs in each of the above categories. For examples of designs created with the Combat Playfield Editor, click here. Please do not submit both Tank and Cloud binaries using the same design. Once you have created one or more designs you'd like to submit for the contest, please send the binaries generated by the Combat Playfield Editor to editor@atariage.com. We will post entries to a submissions page as we receive them. Have fun and good luck! Remember, the contest ends at 11:59pm (CST), Sunday, January 25, 2004!